This volume is part of a collection of stories, rhymes and fact books for school libraries and for reading at home. The series moves on from stories told in simple sentences with basic grammatical structures (HOP), through freer use of language (STEP) to the level of reading reached at the end of primary school (JUMP). From these varied and individual books a child can choose one that challenges his or her reading skill. Why are hyenas forbidden meat? And why didn't Daudi listen to the old man's warning? Part of the "HOP STEP JUMP" series of stories, rhymes and fact books for African children, this book is part of the (JUMP) section in which the stories are told to the level of reading reached at the end of primary school. The (HOP) group of books include "In My Father's Village" by Michael Palmer, "Striped Paint" by Rosina Umelo, "The Slow Chameleon and Shammy's Bride" by David Cobb and "The Walking Talking Flying ABC" by David Cobb. In the (STEP) group of books are "Choose Me!" by Lynn Kramer, "Nondo the Cow" by Diane Rasteiro and "Sika in the Snow" by David Cobb. 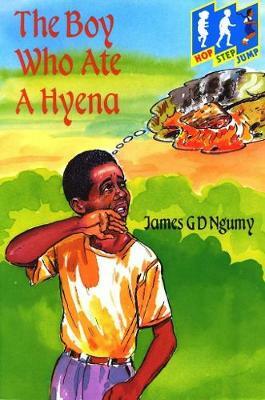 The (JUMP) group of books include "Chichi and the Termites" by Wendy Ijioma, "The Boy who ate a Hyena" by James G.D. Ngumy and "Tickets for the Zed Band" by Lynn Kramer.